Get an instant quote for your vehicle online now by clicking here. It is now a legal requirement for all scrap cars to be issued with an official DVLA Certificate of Destruction (CoD) when they reach the end of their useful life. We collect and scrap cars from all over Leeds, Wakefield and West Yorkshire 5 days a week. Scrap cars can also be dropped off at our site 6 days a week. The Certificate of Destruction can only be issued by Authorised Treatment Facility’s which have been approved by the DVLA. 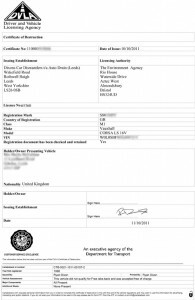 The Certificate of Destruction is the only form of document recognised by DVLA as proof that a car has been destroyed at an Authorised Treatment Facility. If you scrap your car without obtaining an official Certificate of Destruction you could be fined by the DVLA, or even worse, if your car ends up being returned to the road by an unscrupulous operator you could face prosecution if it is later used for criminal activity. When you choose Dixons Vauxhall Spares to recycle your scrap car we will issue you with a DVLA Certificate of Destruction, using our secure online link to the DVLA’s vehicle registration database. 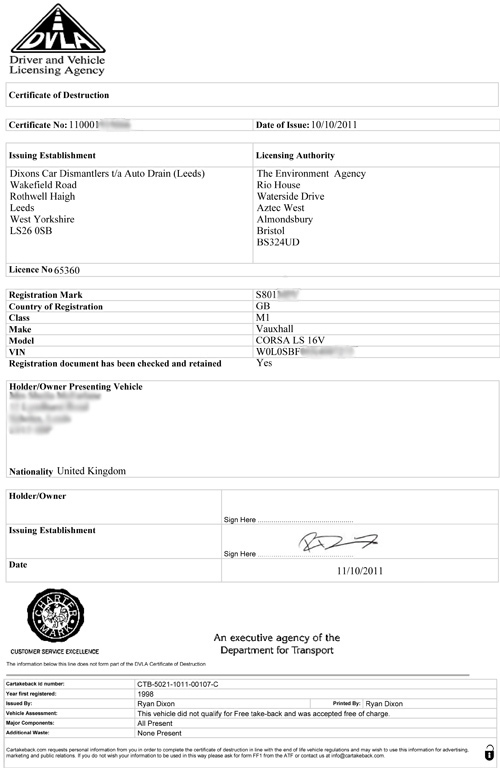 We can issue your certificate as soon as your car has arrived on site while you wait, or we can send it to you by e-mail or post to an address of your choice. There is no need to contact the DVLA yourself as Dixons Vauxhall Spares does everything for you, giving you complete peace of mind. It should have ‘Certificate of Destruction’ written below the DVLA logo. PLEASE BE AWARE OF IMITATIONS! You should sign the document in the ‘Holder/Owner’ section, as soon as you receive it. Take the M1 or M62 towards Leeds, follow the M621 into Leeds, take the Stourton exit (Junction 7) follow the A61 towards Wakefield signs. We are approximately one mile on the left.